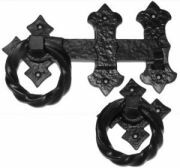 Traditionally manufactured from malleable iron and enhanced by modern technology each of the black iron door furniture products are protected by an anti rust phosphating treatment, and then black powder coated. 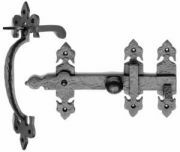 Ludlow Foundries black iron Fleur de lys antique finish letter plate, supplied with fixings. 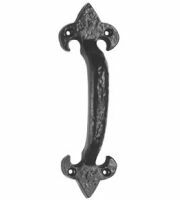 Ludlow Foundries black iron antique finish traditional letter plate. 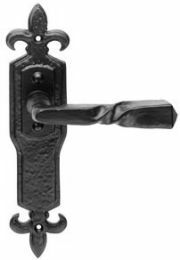 Ludlow Foundries black iron antique finish thumb latch set, handle size 200mm, latch 140mm. 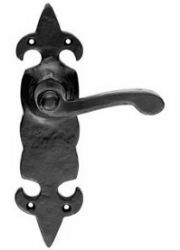 Foxcote Foundries black iron antique finish thumb latch set, 127mm catch. 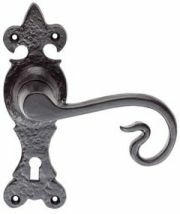 Ludlow Foundries black iron antique finish ring handle gate latch, size 190mm x 114mm. 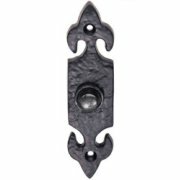 Ludlow Foundries black iron antique finish suffolk latch, length 234mm latch 188mm. 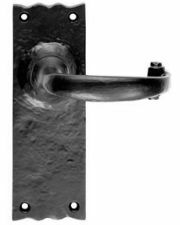 Back of handle to end of lever approx. 76mmm. 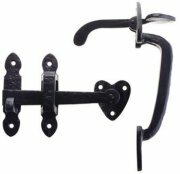 Ludlow Foundries black iron security door chain, overall size 135mm x 85mm. 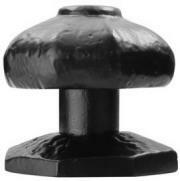 Black iron screw in door studs, available in small 15mm square or large 23mm square, screw in door studs. Ludlow Foundries black iron plaque covered escutcheon (keyhole cover). Size 45mm x 29mm. Foxcote Foundries black iron letter plate with knocker. Overall size: 304 x 106mm, aperture: 195 x 44mm, Fixing Centres: 256mm. 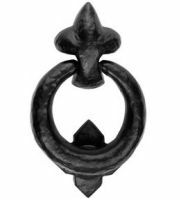 Ludlow Foundries black iron fleur-de-lys door bell push. Size 120 x 30mm, supplied with fixing screws.